I plan on doing a post like this at the end of every month, just to sort of sum up things on various fronts. These are the books I read in January, minus the one I panned a few posts back. Not being a critic, I can make arbitrary rules like not ripping a living author by name, even when I don't like his or her work. I saw five movies in January: OUTLAW JUSTICE, THE DEVIL WEARS PRADA, MATERIAL GIRLS, NACHO LIBRE, and INHERIT THE WIND. A nice varied selection. I remembered watching this movie many years ago and enjoying it, so when I noticed that the local PBS affiliate was running it tonight, I decided to watch it again. I'm happy to report that it holds up quite well. It's the story of the Scopes Monkey Trial, with Spencer Tracy playing Clarence Darrow, Frederic March playing William Jennings Bryan, and Gene Kelly cast against type as H.L. Mencken. The characters have different names in the movie (and the play it's based on), but it's obvious that's who they all are. The cast is good from the big names all the way down to the character actors and bit parts, although Frederic March does some pretty shameless scenery-chewing. But that's the way his role is written, so you can't really blame him. The movie is rather heavy-handed at times, which you'd expect from a Stanley Kramer production, and often stage-bound, revealing its origins as a play. But the good writing, the crisp black-and-white photography, and the fine job by the actors, especially Tracy and Kelly, all combine to make a very good film. I'm glad I watched it again. I've spent a lot of this week in various doctor's offices and hospitals, dealing with assorted medical crises. 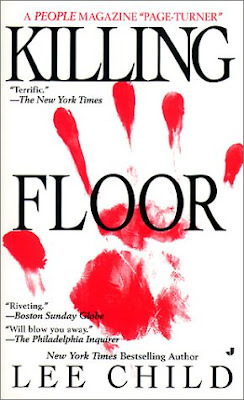 The book I carried around with me to read while I was waiting was KILLING FLOOR, the debut novel by Lee Child and also the first novel in his Jack Reacher series. People have been recommending this series to me for several years, the latest being Mary Kelly, one of my NOAH'S RIDE co-authors, so I decided to give it a try. I wasn't too sure about this book starting out. The style took some getting used to. There are the occasional turns of phrase that sound just a little too British. And the plot seems to be driven by an incredible coincidence. However . . . boy, the action scenes are good. The style really works once you get used to it. Sure, Jack Reacher is pretty much a superhero, but I'm an old pulp guy, so I don't mind that too much. Every time I thought I had everything figured out, Child threw in another twist. Some of them are rather far-fetched, to be sure. Child makes them seem believable, though. So, despite some reservations, I liked this book quite a bit, and I'll definitely be reading more of Child's novels. Today I received my author's copies of BLACK PROMETHEUS: A CRITICAL STUDY OF KARL EDWARD WAGNER, a new chapbook published by Gothic Press that includes my essay "Gunslinger From Prussia: The Adrian Becker Stories of Karl Edward Wagner". I'm no expert on Wagner or his work, and I'm certainly not what you'd think of as a scholarly, academic critic. But the Becker stories (there are three of them) are pretty darned good blends of Western, horror, and alternate history, and I enjoyed writing about them. I'm looking forward to reading the other essays in the book. I've been working on a house-name Western based on an outline I wrote while I was in Austin for the World Fantasy Convention (scribbled on a hotel notepad, actually). I thought I had worked out a simple but compelling plot that would make for a pretty easy book to write. But once I started working on it, I found myself thinking, "Hey, what if I made this guy the villain instead of this other guy?" No, I decided, that would be too complicated and would take too much setting up. So I kept going. But then I thought, "If I did this and this and this, it would set things up so that the other idea would work after all." Once I decided to go for it, though, I realized I had to set up half a dozen other things. Still, the twist was nice and all the clues I was planting seemed to work, but I was having to go through the book and plant those clues, and it got to the point where I had to write a whole new outline just to keep track of everything I needed to do . . . I feel like I should stand up and say, "My name is James, and I'm a plotaholic." After my last few movie-related posts I can't have much credibility left as a film critic, so I figured I might as well continue that trend. We watched the DVD of this movie tonight, and while I don't think it's a great film by any stretch of the imagination, I enjoyed it. I get the impression that most people either like Jack Black or can't stand him. I've seen most of his movies and liked them fairly well (although I think he was badly miscast in KING KONG). In this one he plays a cook in a Mexican monastery/orphanage who moonlights as a masked wrestler so he can afford to buy better food for the kids. I don't know if "whimsical and off-beat" or "just plain weird" is a better description of how it all plays out. It's crude and silly a lot of the time and not really laugh out loud funny, but the film's heart is in the right place and the wrestling sequences are pretty effective. If you like Jack Black, NACHO LIBRE is certainly worth watching. If you don't, you'd be wise to avoid it. What's a good antidote to a ponderous, over-written book like the one I was talking about in my previous post? 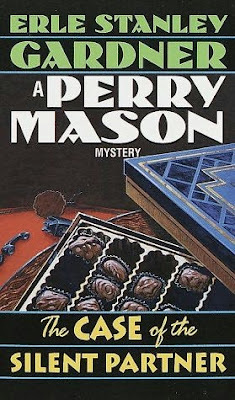 How about a Perry Mason novel from 1940, when Mason still wore a fedora, smoked cigarettes, and didn't mind mixing it up with some tough guys if he had to? (Although there's not any real hardboiled action in this one, it does crop up from time to time in the Mason novels from this era.) Not surprisingly, in this book you get a fast pace, an incredibly complex plot, and seldom a wasted word. From the first book, THE CASE OF THE VELVET CLAWS, in 1933 until about the mid-Fifties, the Mason series is consistently entertaining, at least to me. However, THE CASE OF THE SILENT PARTNER isn't really in the top rank of Perry Mason novels. The motivating action -- the battle for control over a chain of flower shops -- isn't particularly compelling, and Gardner's writing seems a little less crisp than usual. I nearly always get confused when I'm reading a novel by Gardner because the plots are so complicated, and that was true here, too. I did spot a fairly important clue early on that Gardner kept up his sleeve until near the end of the book. There's no big courtroom scene at the end. I know they're hokey, but I like them anyway. The book is notable for being the novel that introduced the character of Lieutenant Tragg. Up to this point in the series Mason's chief antagonist on the police force had been Sergeant Holcomb of the Homicide squad. Paul Drake is mentioned but never appears on screen, and there's no Hamilton Burger at all. Despite the flaws, I enjoyed the book, and the solution to the murder is pretty darned clever. Worth a look if you're a Perry Mason fan and haven't read this one yet, but I wouldn't recommend it as a starting point for the series. I just finished reading a big political/espionage thriller by a bestselling writer. This author isn’t in the absolute top tier as far as sales go, but he’s still ’way up there. And I hope this doesn’t sound like sour grapes, but I didn’t think the book was very good at all. The plot – a simple revenge yarn – was okay, although a little predictable. And there were a few nicely done action scenes. For the most part the style was strictly functional but effective. The problem was that at nearly 700 pages the blasted thing was about three times longer than it needed to be. Scene after scene accomplished nothing, not adding to the plot, the characterization, or even the atmosphere. You’d get a long paragraph explaining what the hero was thinking, followed by another long paragraph restating what the hero was thinking, followed by yet another long paragraph summing up what the hero was thinking. The same thing was true of the assorted villains. Page after page was like that. I’ve heard readers of the Shadow pulp novels by Walter B. Gibson complain about the padding in them, as Gibson tried to stretch the word count, and I can see that at times in the Shadow novels. But I’ve never encountered anything in them as blatantly superfluous as I did in this novel. And yet not only was the book highly successful, so were all the earlier ones by this author. I don’t get it. What’s there that I’m missing? There must be something. I said I was going to write something about every movie we watch this year, so . . . In this one, Hilary and Haylie Duff play sisters who inherit a cosmetics empire from their late father. Hilary is the brainy one, Haylie the hard-partying one. Through some skullduggery, they lose their fortune and have to live like normal people, which of course teaches them many valuable lessons. Then, while watching ERIN BROCKOVICH, they decide to become private eyes and find out who was responsible for their downfall. Oh, yeah, along the way they meet a couple of cute guys. While watching this movie, I kept asking myself, "Were the Olsen twins out of town that week?" But I actually stayed awake through nearly all of it, and since I'm obviously not the target audience for a movie like this, that must say something for it. Plus Brent Spiner is in it, although I didn't recognize him until I saw the credits at the end. Livia knew who he was right away, and she found a particular shot where I had to admit that he looked exactly like Data. I don't know how I missed him. So, this is a fairly watchable film of its type, and to tell you the truth, I'd much rather watch something like this than some ponderous, angsty, indie drama where nothing happens except people sit around and brood for ninety minutes. Anyone who knows me knows that I am nothing if not a fashionista. Seriously, we watched THE DEVIL WEARS PRADA tonight, or rather, the rest of the family watched it. I, uh, dozed off for most of the movie. Actually, from what I saw it seemed like a fairly good film. The cinematography looked great, I liked the music on the soundtrack (what I heard of it), and Anne Hathaway is a really nice-looking young woman. Livia said she expected a blog post on the movie, even though I slept through a lot of it, so that's about all I can honestly report. I had already decided, though, to at least mention all the movies we watch this year, whether I have anything intelligent to say about them or not. I think we all know which category this post falls into. This British trade paperback from Serpent's Tail reprints one of David Goodis’s noirish crime novels, BLACK FRIDAY (originally published by Lion Books in 1954), and a dozen of his novelettes and short stories from the pulps New Detective and 10 Story Mystery Magazine, the legendary digest Manhunt, and Mike Shayne Mystery Magazine. In addition, there's a good introduction by Adrian Wootton that talks at length about Goodis’s pulp career, where he was best known for his aviation and air war stories. I’d read a couple of Goodis’s novels (CASSIDY’S GIRL and NIGHT SQUAD) but none of his shorter work, so I was a little surprised at the wide range of the stories. Most of them aren’t as dark and bleak as his novels, and a couple of them, featuring homicide detective Ricco Maguire, almost qualify as screwball comedies. The later stories, mostly from Manhunt, get darker as they go along. 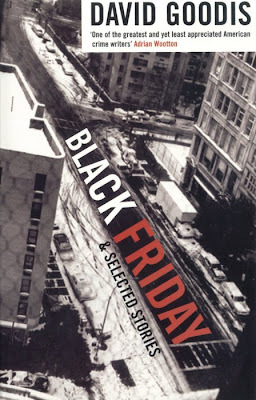 The novel BLACK FRIDAY centers around one of one of Goodis’s typical down-on-his-luck loser heroes, a guy named Hart who is on the run from a murder rap when he accidentally gets involved with a gang of professional thieves in Philadelphia. Not everything is as it seems, though, because Hart is a man with secrets, which are gradually revealed in the course of the book. This is a novel with a great opening – the first forty or fifty pages are some of the best stuff I’ve read recently – and a very suspenseful ending, but the middle of the book meanders around some and drags compared to the rest of it. Still, I enjoyed it quite a bit and will read more of Goodis’s novels. Overall, this is a fine volume and well worth having if you like hardboiled crime fiction. Today I wrapped up my 200th book, which happened to be a house-name Western, like #100 (although in a different series from that earlier milestone). When I started out in this business, I didn't know how many books I'd be able to write, of course, let alone how many I could sell. I thought fifty would be a lot. That goal got revised upward to 100, then 150. Now I don't really worry about things like that anymore. I'm just going to write until I can't anymore. Included in that 200-book total are a few that I wrote, sold, and got paid for, but which were never published for one reason or another. I didn't include the adventure novel that I wrote on spec but failed to sell, or the fantasy novel I ghosted for a fairly well-known author in that genre who never paid me for it. That one was never published, either. I looked back in my records and discovered that it took me seventeen and a half years to write my first hundred books. The second hundred took ten and a half years. No wonder it seems like I've been busy lately. Some of this book was written under difficult circumstances. On January 3rd, my mother suddenly developed a heart problem (atrial fibrillation, for those of you who know about such things). She had to spend that night in the local hospital, but she responded well to the medication she was given and her heart rate got back to normal pretty quickly. I took her back to the assisted living center where she lives the next day. Then, on the morning of January 5th, she had a massive stroke and was taken by ambulance to one of the hospitals in Fort Worth. She was there until yesterday, when she was moved to a rehab center/nursing home, where she'll be for the foreseeable future. Her left side is mostly paralyzed, but each day since the stroke she's showed signs of getting back a little feeling and movement on that side. Of course, we don't know how she's going to do in the long run. She's 90 years old, so recovering fully from such a serious incident is going to be very hard, but at the same time, she's pretty stubborn. I've been going back and forth between the computer and the hospital, grabbing writing time whenever I could. Sitting in the hospital room, I've been able to get more reading done than usual, but that's not quite the way I would have picked to get more reading time. I finished David Goodis's novel BLACK FRIDAY. Comments on it tomorrow, maybe. James Patterson is one of those authors who is very hit-or-miss for me. I’ve started quite a few of his books that I never finished because I just didn’t like them. But I’ve read enough of them I enjoyed so that I keep trying them. I’ve learned that his most popular series, the Alex Cross books, leave me cold, so I avoid them. I haven’t tried his other series, The Women’s Murder Club, yet. But some of his stand-alones are pretty good, like THE JESTER, HONEYMOON, LIFEGUARD, and now JUDGE & JURY. 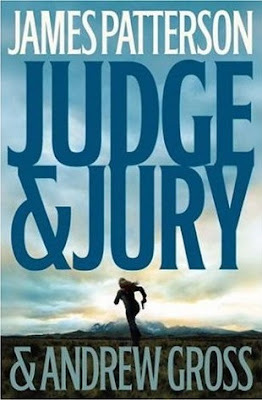 This is part legal thriller, as the government puts mob boss Dominic Cavello on trial and Cavello pulls all the strings he can to get out of it, and part revenge thriller as an FBI agent and one of the jurors from the trial go after Cavello when he escapes justice. As usual, the chapters are very short, the writing alternates between first and third person (this still bothers me, but not as much as it used to), the pace is fast and the plot takes an unexpected twist or two (even though some of them are pretty darned far-fetched). Patterson’s co-author on this book is Andrew Gross, who worked on some of the Patterson novels I liked in the past, so I wasn’t too surprised that this one turned out okay. I assume that Patterson provided the plot and Gross did most of the writing, but of course, I don’t know that for sure. I wasn’t there. I believe Gross has sold some solo books, so I’ll probably read those when they come out, or at least the first one to see if I like it. At this late date, what's left to say about a new Spenser novel? Well, this one seems a little better plotted than most of the recent entries in the series, at least to me, other than the fact that at one point in the story Parker introduces a new element that seems like it might be important, then proceeds to completely forget about it. It features the return of a few characters from earlier books, which doesn't mean a whole lot to me because even though I've read all the Spenser novels, they sort of run together in my head. After all these years, I still like Spenser. I still like Hawk. I even sort of like Pearl the Wonder Dog. The cutesy-poo exchanges between Spenser and Susan continue getting harder and harder to take with each book. But I still found HUNDRED-DOLLAR BABY fairly entertaining from start to finish, and even though the Spenser novels now fall into the category of guilty pleasures for me, I'll probably continue to read them. And the title of this one puts me in mind of a William Campbell Gault novel I read ages ago, called THE HUNDRED DOLLAR GIRL, I believe. One of Gault's Joe Puma novels, I think. I don't remember anything else about it except that I liked it, which is no surprise since I've liked all the Gault novels I've read and don't know if he ever wrote a bad one. Also, if Blogger's count is accurate, this is my 700th post. The honor (?) 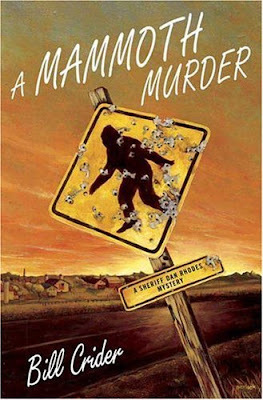 of being the first book I read in 2007 goes to Bill Crider’s A MAMMOTH MURDER, the 13th book in the Sheriff Dan Rhodes series. If I can make a broad, sweeping statement here (and I think I can, since this is my blog), I believe that Dan Rhodes is the most genuinely likable character in the history of mystery fiction. He’s the sort of guy you’d want to sit down and shoot the breeze with while drinking a cold Dr Pepper, which is no surprise considering his creator. The Rhodes series has other appeals, too, such as Bill’s dead-on version of a small Texas town and the mostly rural county surrounding it. (I’ve always thought of Blacklin County as being Comanche County, for those of you familiar with that part of Texas.) And the supporting characters who appear in every book are a great ensemble, too. Then there are the tuckerizations and the old paperback and movie references . . .
Well, I could go on, but I’ll just say that this is a particularly well-plotted entry in the series, with buried mammoth bones, an archeology dig, a possible Bigfoot sighting and resulting invasion of Bigfoot buffs, feral hogs, several murders, and some nice action scenes. All this plus Speedo, one of my favorite fictional canines. Wonderful stuff and highly recommended. I'd never heard of this low-budget, shot-in-Spain Western until we ran across a cheap copy of the DVD at Wal-Mart. It has a really traditional plot: a couple of reformed, retired outlaws (Willie Nelson and Kris Kristofferson) help the son of one of their old friends track down the man who killed the kid's father. The killer is another former member of Nelson's old gang. If you're thinking that this is just an excuse for some country singers to dress up like cowboys, ride horses, and shoot guns, you're probably right. At least half of the scenes in this movie seem to be swiped from other, better films (mostly THE MAGNIFICENT SEVEN), and a couple of plot twists make absolutely no sense at all. But Willie is pretty good in his role and the rest of the acting is halfway decent, there's an occasional good line in the script, and the scenery is nice. There are worse ways to spend an hour and a half.